All lectures are free for MOAH members and $10 for non-members (cash only, please). Wine and light refreshments will be served. 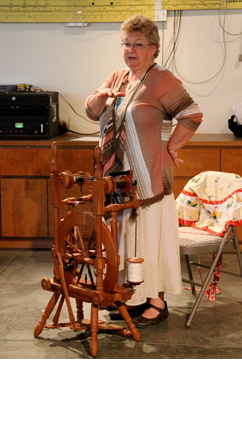 Join us for an evening that correlates with our current exhibit: The Happy Homemaker: History of Household Appliances as Diane Rosland discusses the evolution of the kitchen and kitchen appliances. Rosland will explore the history of the Legendary Pioneers of the Domestic Science Movement examine the inventors behind the function of the kitchen and kitchen appliances and explain how kitchens and appliances have evolved over the past century. About the Speaker: Diane Rosland was attracted to the kitchen at a young age and went on to major in Home Economics and studied the history of Domestic Science in college. Although she works in the real estate industry now her passion and love for the kitchen has never diminished. Rosland has worked as a Food Editor for Good Housekeeping Magazine was a ghostwriter for numerous cookbooks and even started a catering business. The kitchen is Rosland's domain and she has endured a variety of experiences that she will be sharing with us! The Peralta Consort is a mixed ensemble performing music written before 1800 on a mixture of period and modern instruments. Russian-born and Israeli-raised classical guitarist Yuri Liberzon has been recognized for his impressive technical ability and musicality. USCIS has granted Mr. Liberzon ‘Alien of Extraordinary Ability’ United States Permanent Residency based on his achievements in the music field. Motivated by a desire to realize his potential, Yuri was privileged to come to the United States as a student to study at the Peabody Conservatory of the Johns Hopkins University. He was awarded full scholarships to study with two of the world’s leading guitar masters: Manuel Barrueco and Benjamin Verdery. Yuri received his Bachelor’s degree and Graduate Performance Diploma from Peabody Conservatory as well as Master’s degree from Yale University. Rive Gauche's specialty is French cafe-style music of the 1920s and 1940s. They play at public and private events in the San Francisco mid-Peninsula area. All summer concerts are free for MOAH members and 10.00 for non-members (cash at the door only, please). Wine and light refreshments will be served. Bring your broken items to Repair Cafe! Don't throw it out, get it fixed! There are repair volunteers on site that will help fix your broken items and breathe new life into them. Open Warehouse Day, July 13, 2019, 1pm to 4pm. We are happily hosting our annual members-only Open Warehouse Day at our warehouse in San Carlos! This is an exclusive event for MOAH members. You will have the opportunity to browse our diverse collection spanning over 6,000 artifacts and counting. If you are not a member, visit our membership page to join and receive all of the benefits of membership plus exclusive access to this annual event! Wine and light refreshments will be served. The Museum of American Heritage (MOAH) presents the 15th Annual Vintage Vehicles and Family Festival (VVFF) on May 4, 2019 from 9:30 am - 2 pm. Located at the Museum of American Heritage, 351 Homer Avenue in Downtown Palo Alto (between Waverley and Bryant). This free annual community event is being hosted in collaboration with the City of Palo Alto's 97th May Fete Parade & Fair. A variety of unique vintage cars will be on display for the public to enjoy. To round out the celebrations, MOAH will be hosting an open house featuring many family friendly activities. The museum's exhibition, The Happy Homemaker: History of Household Appliances, will be open for viewing. Stay tuned for more classes!